Back in Sydney I had a colleague who taught me a lot about Chinese food. Some of his recommendations led to great adventures around Sydney's suburbs in search of the best Peking duck. In London, the foodie members of my team are Indian and I've been pestering them for recommendations of their favourite places to go ever since I joined. While a few places in the West End were recommended it was Saravanaa Bahvan out in East Ham that caught my attention. A vegetarian restaurant in a random suburb is surely going to do authentic food better than the city? On Sunday I made the trek (actually it wasn't too bad thanks to the speedy Jubilee line) out to East Ham for lunch with an old school friend. Just like the old days in Sydney I was armed with a list of recommendations to try. I'm not familiar enough with Indian food to pick out all the different flavours and spices we ate, all I know is that I enjoyed the food. There were a few reoccurring themes throughout the meal with the same sambar and coconut chutney accompanying many of the dishes we ordered, but it never felt repetitive for me. The biggest surprise came when the falooda I'd ordered for dessert arrived. I wasn't expecting a red and pink dessert with an umbrella on top. I ate it all the same though! The Medhu Vada (£1.45) are deep fried balls of dough made from lentil of gram flour. The vada themselves are relatively plain and served with the sambar and coconut chutney to spice them up. The Curd Vada (£2.25) are a favourite of my colleague. The vada are covered in a sour youghurt and topped with puffed rice. The sour yoghurt is a bit of an acquired taste, but I enjoyed this one. The Tomtato and Onion Uthapam (£2.95) is made from rice flour and again served with the sambar and two different chutneys (both coconut based I think). We didn't get much tomato in our uthapam. The Vegetable Biriyani (£3.95) wasn't served as attractively as the one I had a Babur, but it was almost as moist. The biriyani was the spiciest dish that we ordered and was cooled by the accompanying yoghurt and onion that was served on the side. I first learnt of dosa's back in Syney and this is only the second or third I've ever tried. The huge Masala Dosa (£2.95) was filled with an potato, fried onion and spices. It was a favourite around the table. 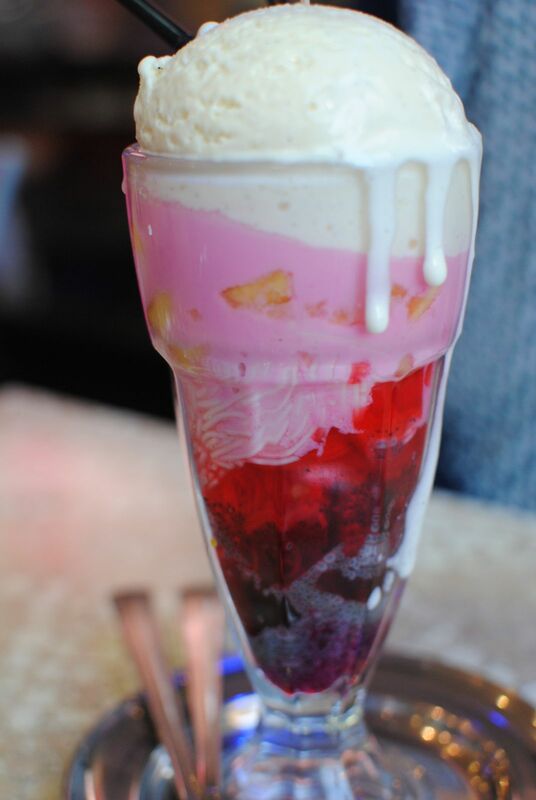 I ordred the Falooda (£3.95) without seeing its description on the menu. It looked more like and ice cream sundae when it arrived and not what I was expecting at all. Jelly, rice noodle, fruit cocktail and ice cream made for an interesting mix of textures of flavours. It was a fun sugar hit, which I think it is designed to be. Let me know when you are planning a visit to the one over the road! Pleased to hear that you want to join the adventure! I reckon it will be the New Year before I have a free weekend to make it over to East Ham again. I think London excels itself when it comes to Indian food yet somehow Sydney drags its feet a bit. I'm struggling to find a really good Indian place I can rely on, and one that doesn't blend in with all of the other bland ones I've visited. I wish a few of those Indian Londonners would move down here! Totally agree, Indian is one of the cuisines that Sydney doesn't do very well. The best curry I had during my time there was a goat curry at Bayleaf Brasserie in Crows Nest. Worth a visit if you are ever in the area.